It's been a while since I bought a useless random purchase. Recently I've been thinking of investing in step machine/staircase/stepper (delete as appropriate). My useless random way of thinking, is that I could condition my legs for the hills without the need for hills and/or childcare. Simples? Advice anyone? I'm really looking for a backup plan in case we get another winter like last. Long suffering readers of this blog, may recall that winter on the hills is not a good combination for me. Anyway, this hasn't gone further than my crazy thoughts and quick look through the wonder and joy that it Amazon. First to note is that such a machine isn't as readily available as they once were during the height of the craze. Secondly, the extremes are quick comical. Yes, you do get what you pay for. 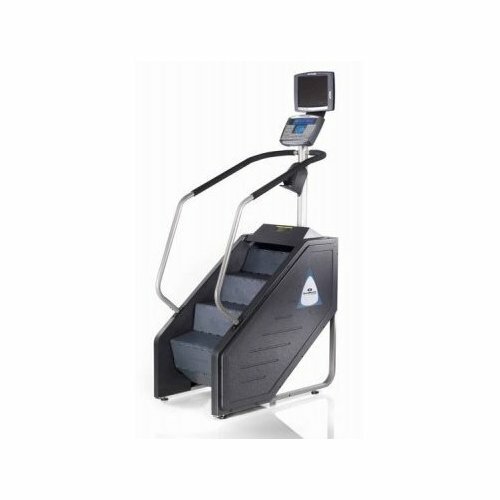 How about the StairMaster Stepmill Stepper. Yours for a mere £7194. I've got one of these in the house already. It's just not motorised. One end of the extreme. It's not really in my budget. Especially considering - let's be honest - I'd barely use it. It would be more cost effective to march up and down the stairs in my office building. Then there's this budget contraption. The Sitting Stepper - Personal Portable Mini Step Up Exerciser, retailing at £8.99. Surely they've got a cheek adding "exerciser" into the product name? The latter is hilarious. What a great cardio workout from the comfort of your sofa. I can sonic's face now. I could even do it at work. You know how I'm always moaning about time constraints. A wee Loch Lomond screensaver on my PC and I'd be half way up Conic Hill. Not the same but affordable. I used to enjoy this machine in our local gym. That little toe thing is hilarious! Totally something my mum would have been scammed into buying! LOL. Just plonk Cairn at the toys in Lewis's, then do your session running up the down escalator, with the occasional surge to the top to check that all's well. Sorted. Have you heard of a versa climber? that might be better idea. And of course there's the old fashioned Concept 2 Rower, it might not be event specific but it'll give an all body workout.